*provide a myriad of ways for students to demonstrate their knowledge. Shurley English provides the opportunity for students to learn grammar and the connection to writing at such great depth that, when the process is taught correctly, the evidence of this knowledge is seen in a child’s writing. We teach students how to really think about using the knowledge they’ve acquired…we teach them to know the content, think about the content, and process the content correctly. 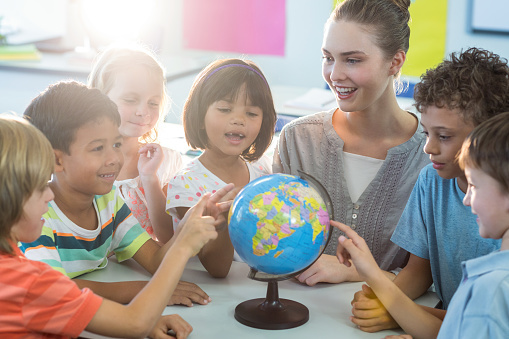 By demonstrating a Jingle, the teacher is showing the student how to learn a language arts definition and think about it, not just memorize it. The questions asked during the Question & Answer Flow are the set of criteria by which we measure a student’s understanding of specific grammar concepts. So, that’s your rubric, and when your students correctly identify the parts of speech of each word in a sentence or classify a sentence type, using the Q & A Flow, you have an authentic assessment opportunity! Even though the Classroom Practices/Chapter Check-ups are essentially paper assessments, they’re still authentic. Students take the information learned and apply it to questions they’ve never seen. This is teaching them how to think about using the knowledge they’ve learned. Have you ever witnessed your students revising their Sentence Blueprints/Practice & Improved Sentences and discussing word choice with another student, or simply thinking through the process of finding a synonym/antonym to improve their word choice? These actions will eventually become second nature to them. This is a form of an authentic assessment…because it is observable. Writing is the obvious authentic assessment in Shurley English! Whether it’s an entry in a journal, a short constructed response answer, a presentation, or the final paper of a formal piece of writing, the teacher can observe a student’s depth of knowledge. The teacher can see and hear where grammar, usage, capitalization, punctuation, and spelling have been used correctly or incorrectly. In Shurley English, the Writing Evaluation Guide (WEG) and Teacher Rubric are key components to the process. The WEG teaches students how to start thinking about what they write and how to apply the skills they’ve learned to their writing. The Teacher Rubric is used to measure the student’s work against specific criteria. If you imagine the process that the student experienced in learning specific information, understanding the information, and then actually applying the information in a meaningful and realistic scenario, it’s clear that IS an effective form of assessment. So, don’t just leave your academic assessment up to the paper test, AND AVOID TEACHING to TEST! Be creative and assess your students’ knowledge with authenticity and purpose. When you think of testing, do any of these statements come to mind? We’re all familiar with national standardized testing, the numerous true/false or multiple choice tests a teacher gives throughout a school year, along with the benefits these assessments can provide. One school of thought says that assessments are a key component of learning because it helps students see how well they understand subject specific material. Others say assessments can help motivate students. Still, testing often feels like a necessary evil that all teachers must do to show evidence that students have learned the content teachers worked so hard to teach. I’d like you to consider looking at the way you assess your students through a different lens. What if your student assessments consisted of noting missed cues while a child reads from a real book; recognizing correct or incorrect grammar usage and punctuation in a student’s essay or hypothesis in Science; or the actual act of using measurement to build a raised garden bed as opposed to solely using typical paper, true/false, or multiple choice assessments? Assessments do come in all forms! If you’re differentiating your instruction for students in the classroom, then differentiating the way your students are assessed is a strategy for best practice. To me, it makes sense why, in school, I thrived with hands-on and oral work, but struggled taking paper tests; I’m still a horrible paper test-taker, but ask me to “show” you how something applies to a real life scenario, and I’ll nail it all day long. That’s what a REAL Assessment or Authentic Assessment is all about! You might have heard the terms, Performance Assessment, Alternative Assessment, or Direct Assessment-all common names for the Authentic Assessment. These kinds of assessments ask students to demonstrate the knowledge and skills they’ve learned when applying them to real-world tasks— then measuring their performance against a set of pre-determined criteria in the form of a rubric. REAL Assessments value the thought behind the work and the process, as much as the finished product. So, before you start planning all of your paper tests, consider learning more about and creating a real, authentic assessment. Your students will welcome the opportunity to show their knowledge in a new way! -You have just read part one of a series on Authentic Assessments. Are you ready for part two? Click here.